Whether you’re counting down the days to the Impetus-PEF Triathlon like a kid who can’t wait for Christmas, or wondering how on earth you thought you could ever do a triathlon – there’s still time for some good training to make sure race day goes well. 1. Preparation is key to success. Prepare when and how you are going to get your last training sessions in. Are you going to swim at the pool near work? Can you run part of your journey to or from work? Prepare for the race day as well. Make sure you’ve tested all your kit, tried out your nutrition strategy and practiced your transitions. Then on race day, stick to it. 2. Consistency is vital. Don’t make the mistake of making up for missed training sessions by doing a hard run or one long ride! It will completely wipe you out and you’ll probably end up not training again until a week later. Consistency is the key and a little and often is the best plan. Try to make your training fit your current lifestyle. You’ll see big improvements if you can put together even a few weeks of consistent training leading up to the race. 3. To get quicker, you have to go quicker. Across all three disciplines, make sure you’re varying the intensity in your sessions. If you have two run sessions in a week, make one run slightly longer and run steadily enough to be able to hold a conversation (say 40 minutes of steady running). Then make the other session interval-based (maybe a 10-minute warm up with six two-minute bouts of effort followed by a one-minute recovery. Finish with a 10-minute cool down). The effort should be above your race day pace. Similarly, in the pool, split the distance you plan to swim into smaller chunks and vary your swimming speeds. By varying intensity you’ll see improvements and make training interesting! 4. Don’t just train alone, train with other people. Triathlon is an individual sport, but I’ve learnt more from training with others. Cycle rides are also for socialising at the all-important coffee and cake stop! Swimming can be boring, but if you’re with a group, you’ll swim harder and training will be fun. And to counter the loneliness of distance running, plan at least one run a week with a better runner. It will improve your running and your patter! 5. Make training fun. Training can be hard work. Now is the time to find ways to make it fun. Take a different bike route, try a new pool, or run point-to-point and turn it into an adventure. It’s not rocket science, but training doesn’t have to be complicated to help you see improvements. 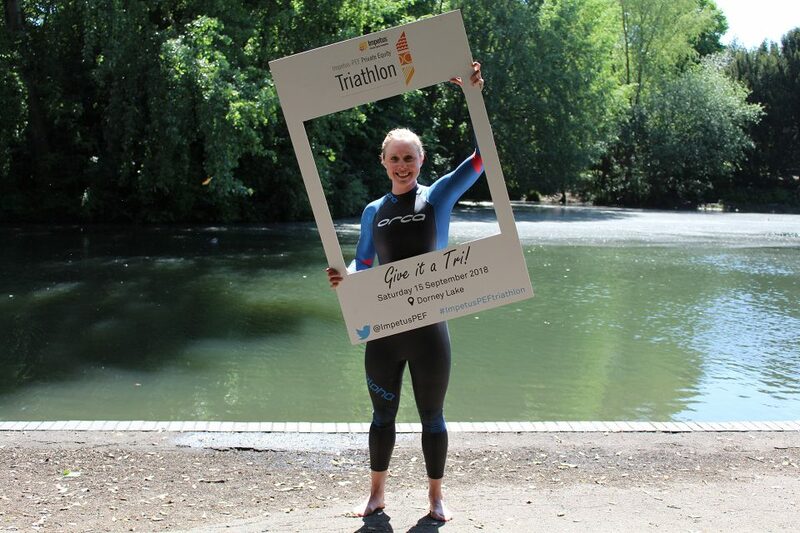 Most importantly, remember that this is all about having a fantastic day at the Impetus-PEF Triathlon and raising money to support their vital work to transform the lives of young people from disadvantaged backgrounds by ensuring they get the right support to succeed in school, in work, and in life. Have that goal in mind and you will keep on track. Any questions on fine tuning your training? Ask Natalie Seymour on Twitter @natalieseymour9 and let us know how your training is going @ImpetusPEF. If you haven’t already, register for the Impetus-PEF Triathlon or find out more. Your fundraising target is £400 per person. If you haven’t already, create a JustGiving page and link it to our JustGiving campaign. Also, check out your Fundraising Pack. Natalie Seymour is a professional triathlete, psychologist and former international hockey player and is competing in the Impetus-PEF Private Equity Triathlon on Saturday 15 September 2018. Join us this summer and swim, cycle or run at Dorney Lake to transform the lives of disadvantaged young people. Last year, over 350 participants and 50 companies battled it out, watched by hundreds of spectators – this year will be even better! So go on, give it a tri!